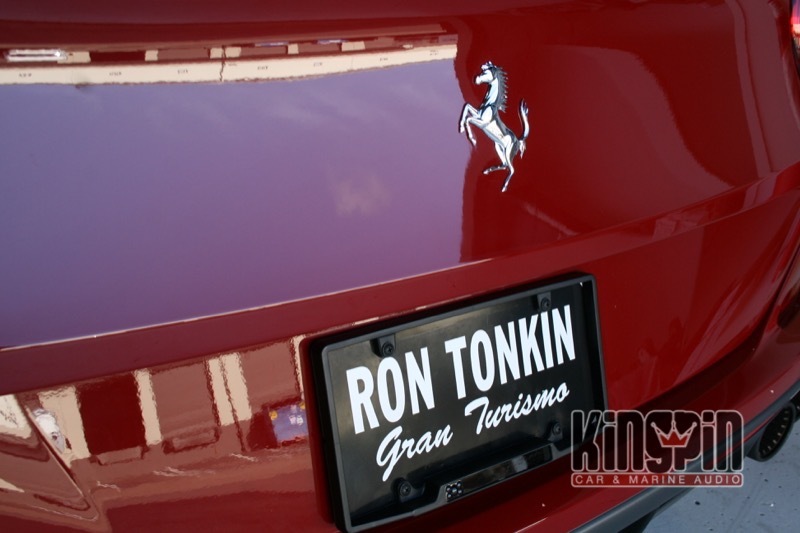 A client from Reno had Ron Tonkin Gran Turismo coordinate the installation of a Ferrari California K40 Radar detector here at Kingpin Car and Marine Audio before he took delivery. 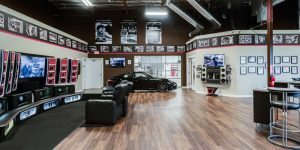 We discussed where and how the client would be driving the car to design a system that would give him the features and performance he wanted. We proposed a full K40 RL360i radar detector and laser defuser system for the exotic coupe. With the approval of the customer, we set to work. The laser defusers sit perfectly positioned to protect the Ferrari from laser attack. Our one-bracket solution ensure proper aiming of all the components. The factory, as well as our aftermarket, wiring is joined with quick-connects. We added a quick-connect on the car-side wiring for our new laser and radar sensors. Joints in our bracket assembly allow for perfect alignment. Work on the bracket was completed out of the car. 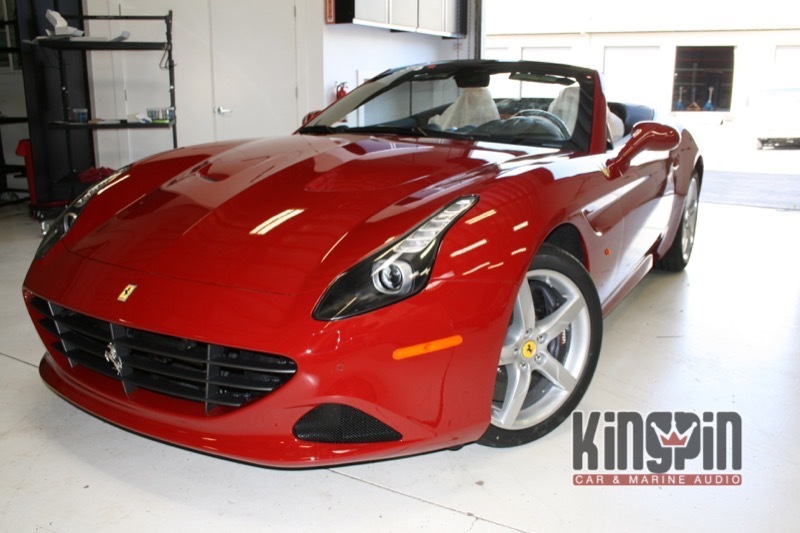 The front bumper of this stunning Ferrari California is a perfect platform for a premium custom-installed radar detector and laser defuser system. 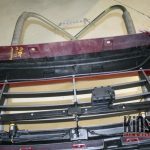 Our team started the project by removing the front bumper and placing it on a protective pad. We took a series of measurements and welded together a steel mounting bracket for the K40 equipment. The bracket will hold the front radar receiver and a pair of laser defuser G5 transponders. Because we mounted both transponders to a single solid-steel bar, we can ensure that they are aimed correctly to achieve maximum performance. We wrapped the wiring from the three front modules in Tesa automotive cloth tape. 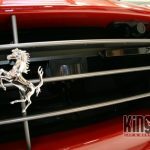 The connections are readily available should the bumper cover ever have to be removed for service. The laser defuser in the license plate frame is barely noticeable. 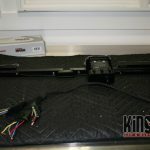 We mounted the rear radar receiver behind the bumper cover and used a K40 G5 transponder with their license plate frame mount. 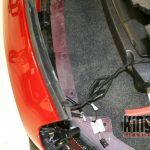 We ran and concealed the wiring for the rear equipment the same way we did in the front. 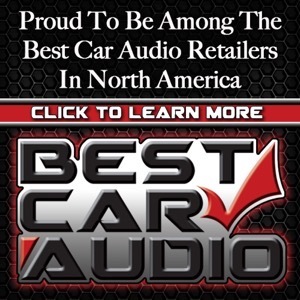 It is crucial to the reliability of any automotive electronic component that the wiring be routed safely and protected from damage due to heat or moving parts. Running wiring near factory sensors or computers can have a negative effect on performance. We mounted the host unit and Laser Interface Module in the footwell of the Ferrari. 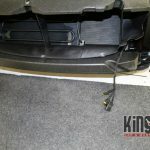 As we always do, we applied one of our Kingpin contact labels in case a technician has to work on the car and has questions about the components we installed. 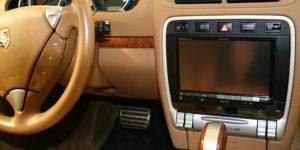 The GPS antenna is mounted at the top of the dash, and the speaker is located to make it easy to hear. 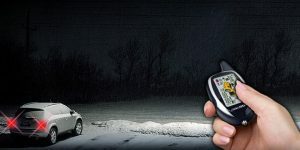 With the Ferrari California K40 radar and laser defuser system installed, we rolled the car outside and tested the functionality with our radar and lidar guns. We coordinated a time to discuss the operation of the system with the Reno-based client. He was delighted with our work. 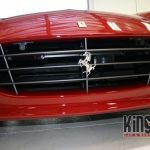 If you are looking for protection for your exotic vehicle, contact Kingpin Car and Marine Audio to schedule a consultation.